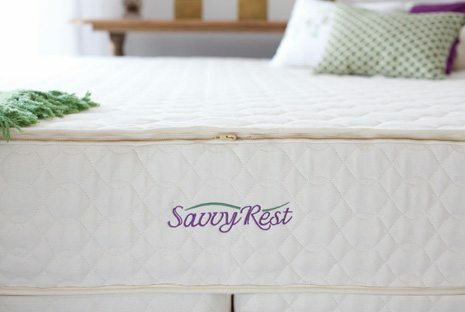 Is The Savvy Rest Organic Tranquility a Good Mattress Choice for My Child? Home > Blog > Is The Savvy Rest Organic Tranquility a Good Mattress Choice for My Child? The answer is YES, the Organic Tranquility will work great for most children! We recommend the Organic Serenity for adults because adults tend to need more support and comfort for their greater weight. However, the two layers of 3″ natural latex in the Organic Tranquility provide a supportive yet comfortable bed for most children. We typically like to recommend a top layer of Soft and a bottom layer of Medium or Firm. These options give a bit of cushion while still providing the support your child needs. A mattress layered Soft on top and Firm on the bottom would still be considered a “medium-firm” mattress and will provide plenty of support. A mattress layered Soft on Top and Medium on the bottom is considered a “medium” mattress, will provide plenty of support for small children, and will probably feel a bit more comfortable to him or her than one layered Soft on top and Firm on the bottom. If you have a larger child, or a child who is or will be growing to a large adult size soon (over 180 pounds), you might consider choosing a Medium layer on top and a Firm layer on bottom. One thing our customers like about the Organic Tranquility is that you can add to it and change it as your child grows. If they want a softer bed or end up needed more support, you can add a Savvy Rest natural latex topper (with 3″ of latex) such that you will end up with 9″ of latex like an Organic Serenity. This is a great kids mattress with many different firmness options, but the part we like the most is that it is organic and keeps our children free from toxic chemicals. You can feel confident that your child will experience a good night’s sleep on a Savvy Rest Organic Tranquility mattress!